Magpie Gemstones is a small family-owned business in the Okanogan Valley in Washington State, we have been buying and selling gemstone beads for many years and making jewelry for a living for even longer, over 2 decades now. Gibby who takes the pictures. You can meet them at the bottom of this page. Thanks for coming by to take a look. We employ a direct-sales model that eliminates the middleman. With years of experience in the trade, many wonderful business partnerships and connections and an eye for quality, design, and price, the best beads are hand-selected at the best price for you. With Magpie Gemstones wholesale to the public you will receive 40%-50% savings over standard industry retail pricing without membership or faux wholesale gimmicks, and up to 30% off additionally. We do not make you jump through hoops to get wholesale prices on top quality product. You buy only what you need. No 10 strand minimums. We know that you need an assortment to succeed. Be assured that we strive for the best quality that really does make a difference in your finished product. Our clients will tell you, check out our testimonials. Our products often sell out as we choose the very best at the best price and sometimes that means we have few in stock. The items on this website can usually not be replaced. They are unique and of excellent value. If you see something you like or need we strongly recommend getting them now and getting the amount you need. The nature of gemstones also limits the ability to always replicate a certain stone, cut, or patterning. You may be able to get them somewhere else but not at this quality and price. We work within a sustainable and transparent business model. Check out our Mission Statement. This means we make the best decisions based on what is in the best interest of everyone we interact with from our suppliers, the Earth, our community and our clients. If we all succeed in a good way then we will continue to support one another and everyone succeeds. Wholesale quality turquoise and gemstone beads at very competitive prices and excellent customer service are what you receive from Turquoise Magpie Gemstones. Click here to read our mission statement. Professional jewelry designers need to purchase quality low priced beads to be competitive in today's jewelry market. Our promise is to provide quality beads and gemstones at wholesale prices so you can succeed at making your successful jewelry business a reality. Our beads and products really do make a difference in how your product is received. As a jewelry designer, you want to know what you are selling to your customers. We disclose all treatments to stones such as being dyed, stabilized, or heat-enhanced to the best of our ability and knowledge. We also will describe any flaws in the beads you may be concerned about like chipped holes. We have been in the trade for years and we make it our business to stay abreast of current treatments and procedures. We ensure that the gems are of the best quality for the price because we take pride and a lot of effort to hand pick the finest beads. We do not just choose a stone and let the vendor fill our order. 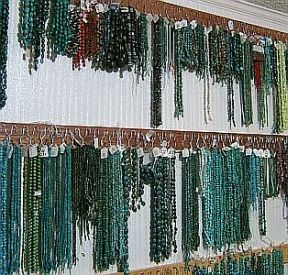 If we must order beads from a distributor to fill a custom order we will send back any beads that do not meet our high-quality standards. It is hard to buy online and not see gemstones in person and we understand that. I attempt to be my client's eyes so they can be assured they are getting good quality. As a bead buyer you want to know you are getting the best price and that the beads you purchased will get to you quickly and that they will be what you want them to be. All products at Turquoise Magpie Gemstones have a money back guarantee. After payment is received, your order is shipped within 24 hours Monday through Friday for U.S. orders and within 48 hours on International orders. There is no shipping on holidays or weekends. Welcome to Turquoise Magpie's Magpie Gemstones. We hope you will agree that the beads are beautiful, the prices are amazing and the selection creates the perfect pallet for you to create beautiful pieces that will wake up the world. I am a self-proclaimed beadaholic, crazed bead hoarder, and slinger. I started selling jewelry professionally in 1990 in galleries, art shows and farmers markets part-time while working as a family therapist. 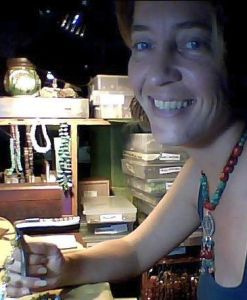 I then traveled for seven years, selling jewelry, beads, hand-made clothing, and stones at festivals and fairs. When I quit traveling, I couldn't stop buying turquoise and gemstones from the excellent suppliers I had met and formed relationships with over the years, so I sold some on eBay, and www.turquoisemagpie.com was born in 2005. Now with suppliers that have factories in India and Hong Kong, I started offering gems and beads wholesale to the trade on this website. I have the hands-on experience to know what sells in jewelry, the ability to spot a great deal, and the eye to pick the best quality. Many bead slingers have never been on the other end, making jewelry for a living. I think I bring expertise that many others can not. I know how hard it is to find the exceptional that not everyone will have at a price that can support a jewelry artist in succeeding. 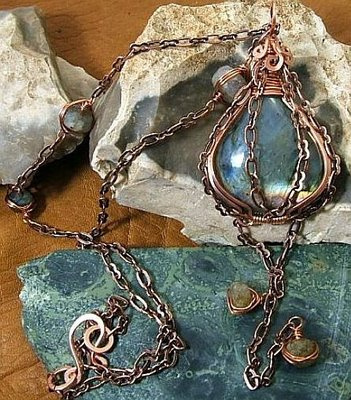 Szarka's designs can be seen on her jewelry website and in her blog. Go to the client's blog to take a peek at the wonderful pieces of wearable art customers have created. Thanks for taking the time to check us out. We are looking forward to forming a long and mutually rewarding relationship with you.